One of the most exciting activities in the world is travel. Finding themselves in an unfamiliar environment, watching the life and customs of the peoples inhabiting different parts of the world, travelers discover a completely different world and sometimes rethink their own lives. But works, the mass of other obligations often become an obstacle to the next trip. Modern design solutions, fortunately, allow us to equip housing in the style of the country we like, to surround ourselves with household items, relics that carry the national flavor of other nationalities. 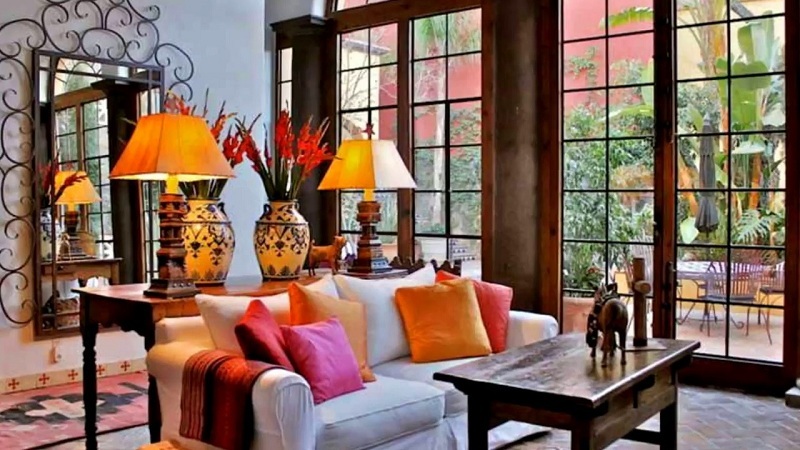 After all, the ethnic style today is both exotic of the east (China and Japan), and the expressive colorful decor of Morocco, and the Egyptian style that combines harmony with simplicity, and the Mediterranean direction with its unique relaxed atmosphere. Since the ethnic direction, in general, implies the embodiment of the traditions of the most diverse peoples, it is quite difficult to unequivocally identify the features of the ethnics popular today. Each nation has its own cultural heritage – an inexhaustible source of unique ideas for decoration. Therefore, designers often go the other way. They create an eclectic interior, complementing their projects with ethnic style details; use the decoration of the desired theme, size, and shade. For those who want to create a special color inherent in a particular culture, it is important to understand the subtle specifics of ethnicity. The interior is always perceived through accessories, attributes. It is through the details that one achieves the right impressions and sensations. For example, creating an interior in the Japanese style, one cannot do without an abundance of natural materials, mats, bamboo curtains, tatami carpets, low benches, sliding partitions. Reflecting the spirit of free Africa will help the choice of the right “clothes” for the walls. An excellent alternative to wallpaper will be surfaces painted in warm beige tones or any shades of ocher. Keeping the right color concept in the design of the apartment, you can create a colorful ethnic-style interior. Any ethnic style can be safely attributed to eco-friendly styles, since long since for the manufacture of decorative elements, furniture mainly natural materials were used: stone, wood, clay, copper, leather, linen, silk and others. Such diversity gives a unique feeling of comfort. This situation looks exclusively textured volumetric, status. In addition, natural materials do not lose their relevance, do not go out of fashion and create a favorable microclimate in the home. Regardless of the national characteristics that were taken as a basis, experts advise choosing the environment from high-quality wood. Another winning solution is a variety of wicker home furniture. All furnishing items, accessories in the rooms should repeat the forms found in nature. Floor coverings can be from natural or from materials imitating natural raw materials. 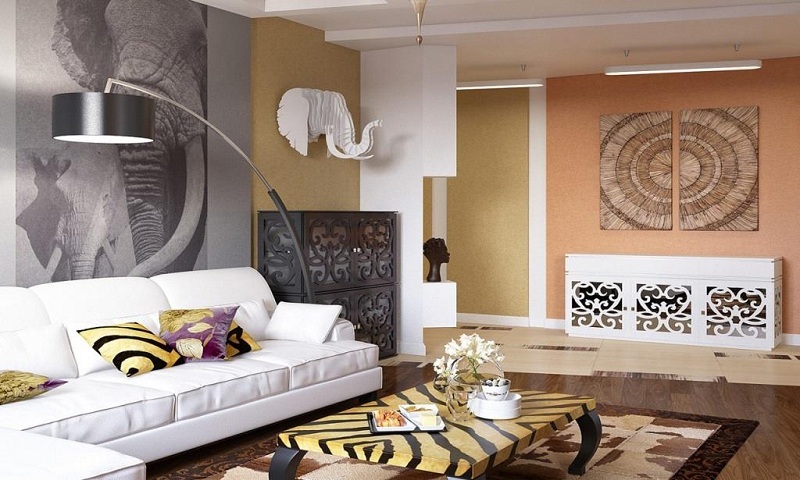 On the floor animal skins, rugs with animalistic prints, tropical motifs look organically. Animal prints of any kind (leopard, tiger, zebra, reptile skin, giraffe) will be a bright, eye-catching accent in any variant ethnics, will look perfect on any surfaces: on the floor walls, sofas, rugs, decorative pillows. Connoisseurs of identity and creative freedom are most often chosen by such sub-types of ethnics as African, Japanese, Scandinavian, Mediterranean, Chinese styles. Scandinavian, for example, has rough practicality. The main principle of design is rationality and simplicity. Such a design style in suburban private domains looks the most advantageous. They are decorated with massive furniture, mounted ceiling beams, install a huge fireplace. 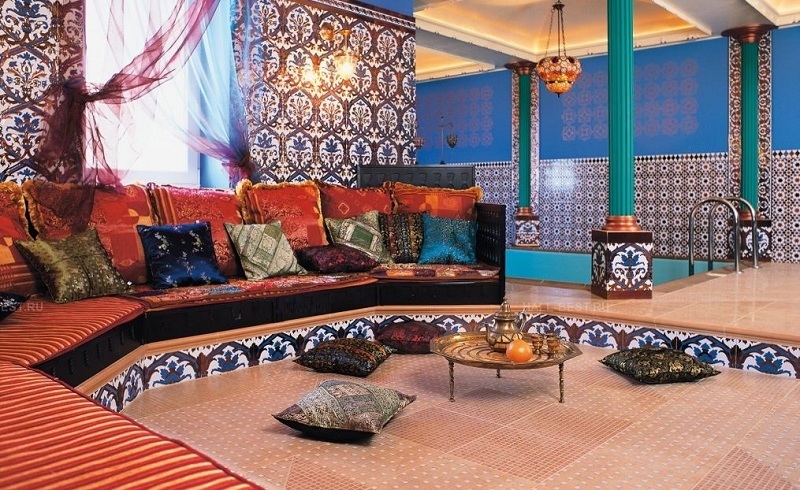 Spectacular textiles with a characteristic ornament will revive the space: floor walkways, rugs, napkins, tablecloths. African – the most exotic. There cannot do without accessories, brought from the black continent: ritual masks, animal horns, embroidered pillows, floor vases. As a decorative floor covering – a colorful carpet, the skin of an African animal. The Mediterranean is chosen by those who love restraint, practicality, and simplicity. There is no brilliance of gold and luxury, instead of sunlight, living plants, and many vintage items. The design of the apartment in such a manner is not only very beautiful, easy, but convenient and comfortable. Japanese style is suitable for minimalists. This is an excellent solution for the inhabitants of small housing. All furnishings in such an interior should always be low, made of light wood, bamboo. The color palette includes cream, milk, natural beige. More expressive colors can be used as color accents. And, of course, ikebana, tea sets, vases, fans decorated with hieroglyphs are appropriate here. Among the main disadvantages of modern interiors, designers call them faceless. 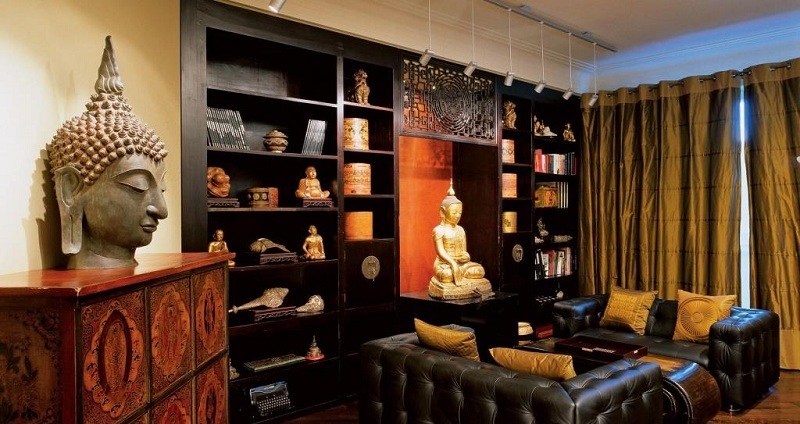 If you assume that this trait is also characteristic of your home, consider integrating ethnic motifs into the setting. They are distinguished by the ability to instantly transform the most ordinary space. 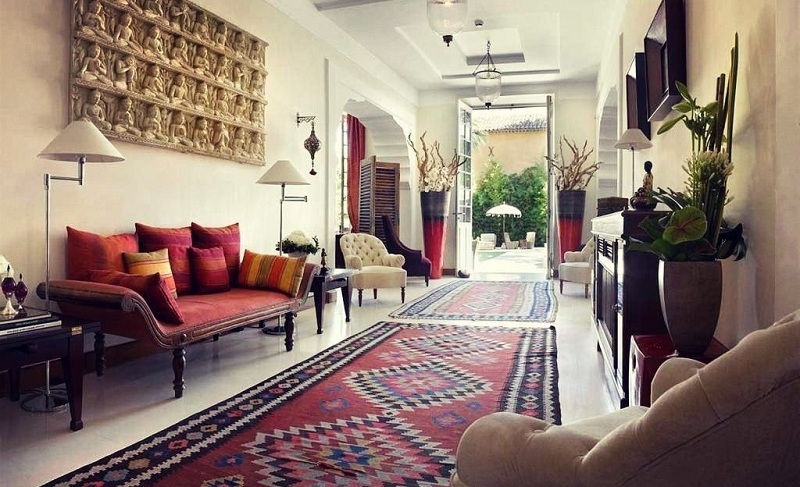 The uniqueness of ethnics is also in the fact that this interior design style today has lost features, signs of national identity, becoming essentially a synonym for the concept of “eclectic”. 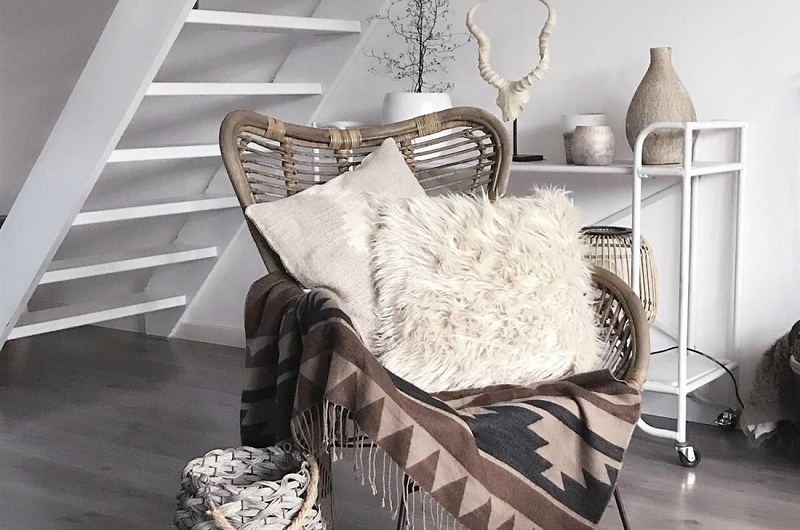 The only thing that will single out among others the direction of “ethnic” is its maximum naturalness, the ecological compatibility of the house, the decor and the decor. Natural materials and colors, unobtrusive ornaments, other integral elements of ethnics have a calming effect, a calming, relaxing effect, therefore they are ideal for decorating private residences and especially recreation areas and bedrooms.